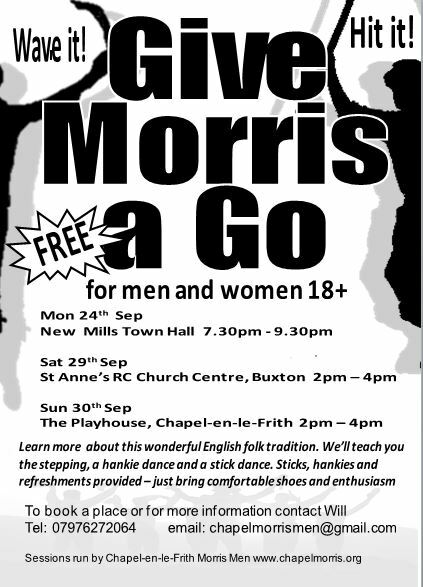 If you’ve enjoyed watching Morris dancing and wondered whether it’s something you’d like to do, then why not come along to one of our FREE ‘Give Morris a Go’ sessions. No commitments. Morris dancing is undergoing a bit of a revival at the moment with more and more people getting involved. Learn more about this wonderful English folk tradition and ‘give it a go’ yourself. We’ll teach you the stepping, a hankie dance and a stick dance. Sticks, hankies and refreshments provided – just bring comfortable shoes and enthusiasm.